Description: Tropic Cascade™ Lomandra has large fragrant yellow male flowers that will not produce seed. It has beautifully weeping foliage and a more compact form. Can handle periods of wet feet and has survived down to -4°C. When planting, make sure a reasonable dose of 8 to 9 month slow release fertiliser is used, especially for nutrient poor soils. 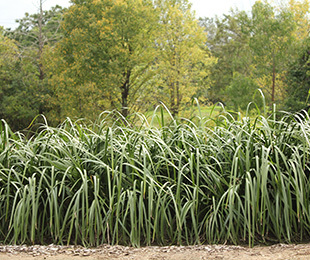 Tropic Cascade™ Lomandra is a good erosion control option as it strengthens the soil 159%. See research for more information. Size: 60-80cm tall x 60-80cm wide (maintains a smaller height when cut back every 3-4 years). Uses: Specimen/mass plantings for residential and commercial. Position: Full sun to moderate shade. Tolerates drought and humidity. 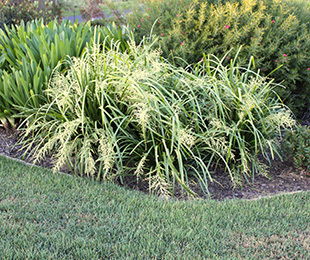 Tropic Cascade™ Lomandra suits most soil types, prefer moist soil. Tolerates periodic inundation, not 5cm or more permanently. Care: Water as required for 8-13 weeks until established. Occasional watering may be required for dry inland regions, WA and SA. Plant in a well mulched garden (chunky mulch is recommended, but can tolerate mulches with fines).Use slow release fertiliser in spring. Every 3-7 years cut back 30cm above the ground (looks better pruned every 3 years, depends on desired look). Where it works: NSW, QLD, ACT, VIC, SA & WA. For ACT, VIC, SA & WA information click here. Lomandra as a genus has undergone a lot of name changes over the years, both by herbariums, and later by the industry. Lomandra hystrix, until the late 1990’s at least was often known in the trade by the synonym Lomandra longifolia subsp. hystrix or even in NSW till after 2000 as simply Lomandra longifolia. Not currently available online, see retail and wholesale suppliers below for where to buy. 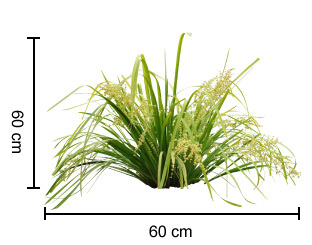 For more detailed information on Tropic Cascade™ Lomandra click here.